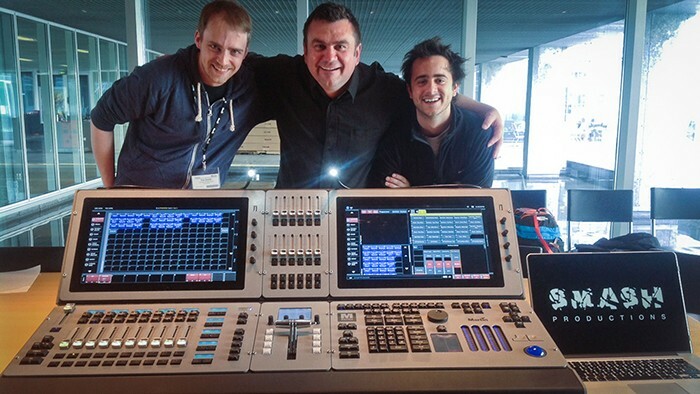 Bristol UK creative visual design practice SMASH Productions has taken delivery of the first Martin Professional M6 control console in the UK and Europe, which will be available for rental and also in action for assorted shows and productions in which SMASH is involved. SMASH, headed by Alex ‘Junior’ Cerio and Tim Smith is known for its innovative, imaginative and fresh approach to production design and the art of creating fabulous environments by combining lighting, video, visuals and scenic elements for all types of live events. Their work encompasses many genres and styles, embracing corporate launches and parties through to touring with top international DJs and bands. SMASH is in the process of investing in key areas of equipment like control surfaces to further facilitate the design side of the business, and the new M6 is an addition to SMASH’s ever growing collection of lighting consoles. The console can be hooked up to media servers in their studio and used for pre-visualising, designing, planning and programming shows in advance. It is also the intention to enable them to have an element of continuity worldwide on key shows. “Investing in control elements to run mixed media shows is very much on our agenda,” explains Alex, adding that they have worked closely with Martin on some of the latest M6 software developments. Already owning an M2GO console and an ether8dmx node, SMASH is well aware of the reliability and familiar with the quick and intuitive operational philosophies of the M series of products. SMASH also chose the M6 as a complimentary controller to its range of LED video walls, media servers and content creation/VJ team, with its VTC and SMPTE inputs, it is perfect for timecode triggered shows. Apart from lighting and video, these could also be automation and relating to a whole range of other effects. Alex and Tim also like the fact that the M6 is modular and fully user-configurable by choosing which interchangeable modules are fitted. The first SMASH Productions show for the new M6 was David Guetta’s special guest appearances on Rihanna’s UK and European stadium shows. SMASH recently provided production and visual design (lighting and video) plus technical coordination for the Main Stage of the Love Saves The Day Festival in Bristol, and Alex is lighting director for David Guetta’s on-going live performances. They also provided LED screen to High Definition Festival. 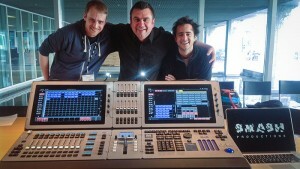 In picture: Tim Smith (Smash), Dave Stewart (show consultant for Martin by Harman) and Alex ‘Junior’ Cerio (Smash).